When you look at the night sky it is easy to imagine that the stars are part of a great celestial sphere. Stars appear to be fixed in relation to each other, and they appear to move about the Earth in unison. This is why most ancient cultures imagined that the stars were a part of a sphere or shell of night, and that all the stars were the same distance away from us. This illusion occurs because even the nearest stars are very, very far away. So how is it possible to say with confidence (as I did in an earlier post) that Sirius is 8 light-years away, or that Betelgeuse is 640 light-years away? There are actually several methods to determine cosmic distances, and these are combined to create what is known as the cosmic distance ladder, but the oldest and most direct method uses the property of parallax. Parallax occurs when you look at an object from two slightly different positions. You probably use it every day, because it is what gives humans depth perception. When you look at an object, each of your eyes has a slightly different point of view. Your brain uses this information to determine which objects are close and which are farther away. This is also why you have to wear special glasses when you go to see a 3D movie. The glasses ensure that your eyes each get a slightly different perspective, which gives the movie the illusion of depth. If you take off the glasses during the movie, it will look slightly blurry. Without the glasses, your eyes see both points of view blurred together. You can see the effect of parallax with a simple experiment. Hold up your thumb at arm’s length, and look at it with only one eye. Without moving your thumb, switch eyes, and you will see that your thumb appears to move relative to more distant objects. This shift is known as a parallax shift. If you bring your thumb closer and do the experiment again, you’ll see that the parallax shift is larger. If it is farther away, the parallax shift is smaller. With a little bit of trigonometry, you can calculate the distance to an object by measuring its parallax. This is how astronomers can measure the distances to nearby stars. Astronomers use the motion of the Earth to their advantage. The radius of the Earth’s orbit about the Sun is 93 million miles. 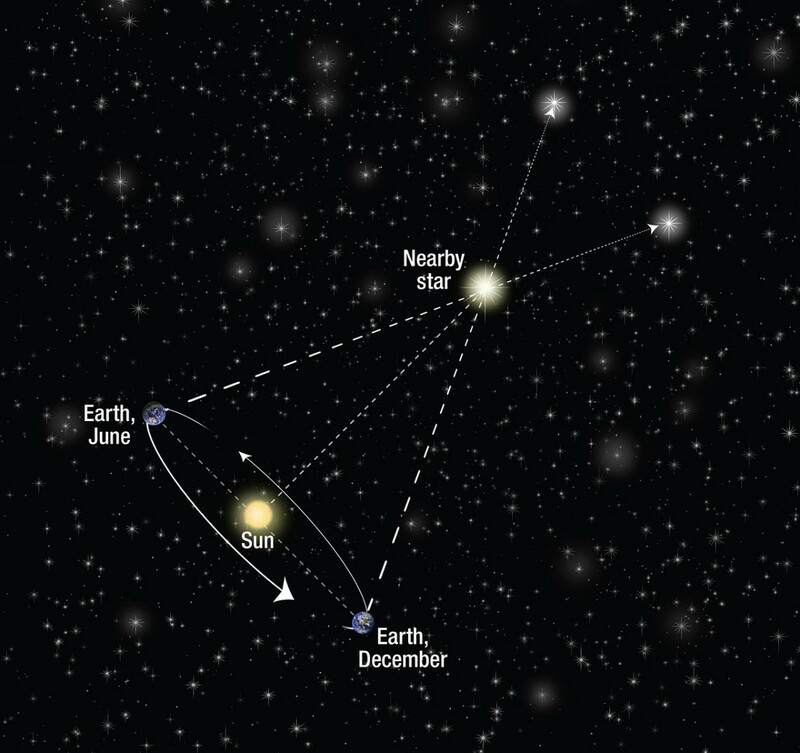 By observing the position of a star on a particular night, and then on a night 6 months later, astronomers can measure the parallax shift of the star from two points of view 186 million miles apart. The bigger the parallax shift, the closer the star. You can see this in the figure below. The parallax of even the closest stars is very small, on the order of an arcsecond, which is 1/3600 of a degree in angle. The star with the largest stellar parallax is Proxima Centauri, which has a parallax of 1.3 arcseconds. It is the closest star to Earth (except for the Sun), with a distance of 4.2 light-years. Current technology can typically measure parallax down to about a thousandth of an arcsecond, or a maximum distance of about 1,600 light years. For anything more distant, astronomers must use other methods. Recently astronomers were able to use parallax to measure the distance to a black hole which orbits a star known as V404 Cygni. As the black hole orbits V404 Cygni, it pulls matter from the star into itself. As the material falls into the black hole it produces light. When only a small amount of matter is being drawn in, the region around the black hole doesn’t give off much light, (known as quiescence) but when a large amount of matter falls to the black hole it can give off an intense burst of light. As a result, V404 Cygni will appear to brighten from time to time. The light from the black hole was observed during quiescence over a period of three months using what is known as the High Sensitivity Array (HSA), which consists of five telescopes across the world. By observing the black hole at the same time, and using a technique known as interferometry, astronomers were able to make very precise measurements of the black holes position. By comparing their measurements with earlier measurements, the authors were able to measure the parallax of a black hole for the first time. They determined that the black hole is about 7,800 light-years away, which is closer than previously thought. It is the farthest distance we’ve measured directly. In the future we hope to measure even greater distances. In October of last year for example, the European Space Agency launched the Gaia Mission, which should be able to measure parallax as small as 20 millionths of an arcsecond, which will measure distances of tens of thousands of light-years. We should soon have a very accurate map of our cosmic neighborhood. Proxima Centauri doesn’t have a parallax of 1.3 arcseconds. It’s 1.3 parsec away, so its parallax is 0.77″.